1. Which of the following are found in extreme saline conditions? (d) DNA molecules with protein coat. 3. Which among the following are the smallest living cells, known without a definite cell wall, pathogenic to plants as well as animals and can survive without oxygen? 4. Which of – the following components provide sticky character to the bacterial cell? 11. Which among these is the correct combination of aquatic mammals? 12. Which of the following represents order of ‘Horse’? 19. Which of the following is made up of dead cells? 20. Identify the wrong statement in context of heartwood. (a) It is highly durable. (b) It conducts water and minerals efficiently. (c) It comprises dead elements with highly lignified walls. (d) Organic compounds are deposited in it. 21. Select the correct route for the passage of sperms in male frogs. 22. Frog’s heart when taken out of the body continues to beat for sometime. (1) Frog is a poikilotherm. (2) Frog does not have any coronary circulation. (3) Heart is “myogenic” in nature. 23. Which of the following cell organelles is responsible for extracting energy from carbohydrates to form ATP? 24. Which of the following statements is correct with reference to enzymes? 25. Which of the following are not polymeric? 26. Which of the following options gives the correct sequence of events during mitosis ? 27. Anaphase Promoting Complex (APC) is a protein | degradation machinery necessary for proper mitosis of animal cell. If APC is defective in a i human cell, which of the following is expected to occur? (a) Chromosomes will be fragmented. (b) Chromosomes will not segregate. (c) Recombination of chromosome arms will occur. (d) Chromosomes will not condense. 29. 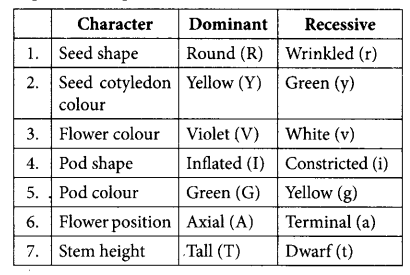 Which of the following facilitates opening of stomatal aperture? 30. With reference to factors affecting the rate of photosynthesis, which of the following statements is not correct? (a) Increasing atmospheric CO2 concentration up to 0.05% can enhance CO2 fixation rate. (b) C3 plants respond to higher temperatures with enhanced photosynthesis while C4 plants have much lower temperature optimum. (c) Tomato is a greenhouse crop which can be grown in CO2-enriched atmosphere for higher yield. (d) Light saturation for CO2 fixation occurs at 10% of full sunlight. 32. Which statement is wrong for Krebs’ cycle? (a) There is one point in the cycle where FAD+ is reduced to FADH2. (b) During conversion of succinyl CoA to succinic acid, a molecule of GTP is synthesised. (c) The cycle starts with condensation of acetyl group (acetyl CoA) with pyruvic acid to yield citric acid. (d) There are three points in the cycle where NAD+ is reduced to NaDH + H+. 34. Which cells of crypts of Lieberkuhn’ secrete j antibacterial lysozyme? 35. Which of the following options best represents the enzyme composition of pancreatic juice? 36. Ababyboyagedtwoyearsisadmittedtoplayschool and passes through a dental check-up. The dentist observed that the boy had twenty teeth. Which teeth were absent? 38. Adult human RBCs are enucleate. Which of the following statement(s) is/are most appropriate explanation for this feature? (1) They do not need to reproduce. (2) They are somatic cells. (3) They do not metabolise. (4) All their internal space is available for oxygen transport. 41. Which of the following statements is correct? (a) The descending limb of loop of Henle is impermeable to water. (b) The ascending limb of loop of Henle is permeable to water. (c) The descending limb of loop of Henle is permeable to electrolytes. (d) The ascending limb of loop of Henle is impermeable to water. 43. 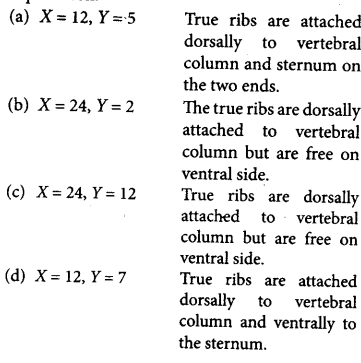 Out of ‘X ’ pairs of ribs in humans only ‘Y ’ pairs are true ribs. Select the option that correctly represents values of X and Y and provides their explanation. (d) Schwann cells and oligodendrocytes. (d) membranes of synaptic vesicles. 46. Good vision depends on adequate intake of carotene rich food. (1) Vitamin A derivatives are formed from carotene. (2) The photopigments are embedded in the membrane discs of the inner segment. (3) Retinal is a derivative of vitamin A. (4) Retinal is a light absorbing part of all the visual photopigments. (d) anterior pituitary gland and stimulates secretion of LH and oxytocin. (d) growth hormone becomes inactive in adults. 56. Match the following sexually transmitted diseases (column Ijwith their causative agent (column II) and select the correct option. (d) they suppress sperm motility and fertiising capacity of sperms. 58. In case of a couple where the male is having a very low sperm count, which technique will be suitable for fertilisation? 59. Thalassemia and sickle cell anaemia are caused due to a problem in globin molecule synthesis. Select the correct statement. (a) Both are due to a quantitative defect in globin chain synthesis. (b) Thalassemia is due to less synthesis of globin molecules. (c) Sickle cell anaemia is due to a quantitative problem of globin molecules. (d) Both are due to a qualitative defect in globin chain synthesis. 60. The genotypes of a husband and wife are JAJB and IAi. 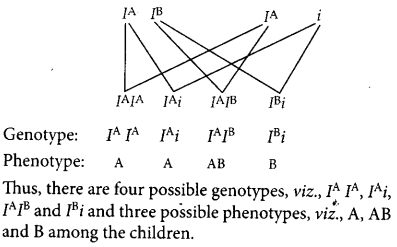 Among the blood types of their children, how many different genotypes and phenotypes are possible? 62. Among the following characters, which one was not considered by Mendel in his experiments on pea? 63. Which one from those given below is the period for Mendel’s hybridisation experiments? 65. If there are 999 bases in an RNA that code for j a protein with 333 amino acids, and the base at position 901 is deleted such that the length of the RNA becomes 998 bases, how many codons will be altered? (d) the leading strand towards replication fork. 67. Which of the following RNAs should be most abundant in animal cell? (d) stabilising selection as it stabilises this character in the population. 72. Transplantation of tissues/organs fails often due to non-acceptance by the patients body. Which type of immune response is responsible for such rejections? (d) mating of related individuals of same breed. 75. Which of the following in sewage treatment removes suspended solids? 76. Which of the following is correctly matched for the product produced by them? 80. What is the criterion for DNA fragments movement on agarose gel during gel electrophoresis ? (a) The smaller the fragment size, the farther it moves. (b) Positively charged fragments move to farther end. (c) Negatively charged fragments do not move. (d) The larger the fragment size, the farther it moves. (c) K < N .
(d) the value of ‘r’ approaches zero. 86. Which ecosystem has the maximum biomass? 87. Which one of the following is related to ex situ conservation of threatened animal and plants? 90. Which one of the following statements is not valid for aerosols? (a) They alter rainfall and monsoon patterns. (b) They cause increased agricultural productivity. (c) They have negative impact on agricultural land. (d) They are harmful to human health. Halophiles, a type of archaebacteria, usually occur in extreme saline conditions like salt pans, salt beds and salt marshes. Viroids are free RNA particles that lack protein coat. They are infectious agents smaller than viruses. Mycoplasmas are the smallest living cells, known without a definite cell wall. They are pathogenic to both plants and animals and can survive without oxygen. Glycocalyx is the outermost mucilage layer of the cell envelope which consists of non-cellulosic polysaccharides with or without proteins. It gives sticky character to the cell. DNA replicates in bacteria just before they divide by fission. Pinus is a monoecious plant, i.e., in Pinus the male and female cones or strobili are borne on the same plant. In Chlamydomonas, zygote divides by meiosis. It exhibits haplontic type of life cycle. Ectocarpus possesses haplodiplontic whereas Fucus possesses diplontic life cycle. An important characteristics that hemichordates and chordates share is presence of pharyngeal gill slits. Gill slits are dorsal in position in hemichordates whereas they are lateral in chordates. A true notochord does not occur in hemichordates. Nervous system is distinctly of vertebrate type being intraepidermal in position and having a ventral nerve cord. Whales, dolphin and seals are examples of aquatic mammals. Trygon and sharks are cartilaginous fishes. Perissodactyla represents the order of horse. Equidae is the family, caballus is the subspecies whereas E.ferus is the species of horse. Spongocoel is the central body cavity of the sponges. It is lined by highly specialised flagellated cells called choanocytes. Coconut fruit is fibrous drupe with a fibrous mesocarp. Cells of vascular cambium divide periclinally I both on the outer and inner sides to form secondary j permanent tissues, i.e., secondary xylem and secondary i phloem. Root hair are lateral tubular outgrowths that j develop from the outer cells of zone of maturation or i root hair zone. The phellem or cork consists of dead and compactly arranged rectangular cells that possess suberised cell walls. Heartwood is the non-functional part of secondary xylem, hence, it does not conduct water and minerals. Testes Vasa efferentia -> Kidney -> Bidders canal -> Urinogenital duct -> Cloaca. Frog’s heart is myogenic, i.e., heartbeat originates from muscles of heart. Hence, it is autorythmic. Wave of contraction originates from sinus venosus and spreads to wall of sinus venosus and both auricles. This compels the heart to beat. Due to this reason, frog’s heart will continue to beat as long as it gets supply of ATP. Mitochondria are miniature biochemical factories where food stuffs or respiratory substrates are I completely oxidised to carbon dioxide and water. The energy liberated in the process is initially stored in the form of reduced coenzymes and reduced prosthetic groups. The latter soon undergo oxidation and form energy rich ATP. ATP comes out of mitochondria I and helps perform various energy requiring processes of the cell like muscle contraction, nerve impulse conduction, biosynthesis, membrane transport, cell division, movement, etc. Because of the formation of ATP, the mitochondria are called power houseS of the cell. Holoenzyme is the complete conjugate enzyme consisting of an apoenzyme and a cofactor. Cofactor may be organic or inorganic in nature. Organic cofactors are of two types-coenzyme and prosthetic group. Lipids are fatty acids esters of alcohols and related substances. Polysaccharides are polymers of mono-saccharides. Proteins are polymers of amino acids and nucleic acids are polymer of nucleotides. Mitosis is divided into four phase prophase, metaphase, anaphase and telophase. During prophase the indistinct and interwined DNA molecules condenses to form elongated chromosomes. The nuclear membrane disintegrates during prometaphase. During metaphase, the chromosomes align themselves at the equatorial plate. During anaphase, centromere of each chromosome divides into two so that each chromosome come to have its own centromere. Chromatids move towards opposite poles along the path of their chromosome fibres. Finally during telophase, two chromosome groups reorganise to form two nuclei. Nuclear envelope reappears, Golgi complex and endoplasmic reticulum are reformed, etc. Crossing over occurs during meiosis. Option (c) also gives the correct sequence of events but it misses step II (nuclear membrane disassembly). Hence, is ruled out as best appropriate answer is answer (a). During anaphase, in mitosis, sister chromatids segregate at opposite poles. Therefore, a defective APC will affect chromosome segregation. When turgidity increases within the two guard cells flanking each stomatal aperture or pore, the thin outer wall bulge out and force the inner walls into a crescent shape. This results in the opening of stomata. The opening of stomata is also aided by the radial orientation of cellulose microfibrils in the cell wall of guard cells rather than longitudinal orientation. C4 plants respond to higher temperature with enhanced photosynthesis while C3 plants have lower temperature optimum. Krebs’ cycle starts with condensation of acetyl group (acetyl CoA) with oxaloacetate to form a tricarboxylic, 6-carbon compound called citric acid. In low concentrations, 2, 4-D(2,4- Dichlorophenoxy acetic acid) is useful in preventing, pre-harvest fruit drop and leaf drop. Paneth cells, present in the bottom of crypts of Lieberkuhn, are rich in zinc and contain acidophilic granules. There is evidence that these cells secrete antibacterial lysozyme. Zymogen cells or peptic cells are present in stomach and secrete pepsinogen. Kupffer cells are present in liver. They are phagocytic i in nature and engulf disease causing microorganisms, i dead cells, etc. Argentaffin cells, found in crypts I of Lieberkuhn, synthesise hormone secretin and j 5- hydroxytryptamine. The pancreatic juice contains sodium bicarbonate, three proenzymes trypsinogen, chymotrypsinogen and procarboxypeptidase and some enzymes such as elastase, pancreatic a-amylase, ] DNase, RNase and pancreatic lipase. It helps in the digestion of starch, proteins, fats and nucleic acids. Boy aged two years will have milk teeth. Milk teeth of man include 8 incisors, 4 canines, 8 molar. Premolars are absent. Residual volume is the volume of air which remains in the lungs after the most forceful expiration. This residual air enables the lungs to continue exchange of gases even after maximum exhalation. Due to this, lungs do not collapse even after forceful expiration. Red blood cells of adult humans do not have cell organelles including nucleus, Golgi bodies, mitochondria, ribosomes, etc. It increases the surface area of RBCs and enables them to contain more haemoglobin (the oxygen carrying pigment). Blood enters the liver from two sources. From the hepatic artery, it gets oxygenated blood and from the hepatic portal vein, it receives deoxygenated blood. Blood in the hepatic artery comes from the aorta. Blood in the hepatic portal vein comes directly from the intestine (containing newly absorbed nutrients), stomach, etc. Atrial natriuretic factor (ANF) is responsible for lowering of blood pressure and volume. The walls of the atria of the heart release ANF in response to j an increase in blood volume and pressure. It opposes | regulation by RAAS. It inhibits release of renin from | JGA thereby inhibiting NaCl reabsorption by the collecting duct and reduces aldosterone release from j adrenal gland. Descending limb of loop of Henle is permeable to water but impermeable to electrolytes. Ascending limb of loop of Henle is impermeable to water but permeable to electrolytes. Schwann cells and oligodendrocytes form myelin sheath around the axon. Myelin sheath serves as an insulating layer, preventing loss of energy of the nerve impulse during its passage along the fibre. Neurotransmitter is a chemical substance responsible for transmission of nerve impulse across synapse. It is released by synaptic vesicle into the synaptic cleft. Neurotransmitter binds with protein receptor molecule present on post synaptic membrane causing its depolarisation and generation of action potential. Gonadotropin releasing hormone (GnRH) is secreted by the hypothalamus which stimulates the anterior lobe of pituitary gland to secrete luteinising hormone (LH) and follicle stimulating hormone (FSH). Epiphyseal plate is a hyaline cartilage plate in the metaphysis at each end of long bone. It is a part of long bone where new bone growth takes place. In adults, elevated levels of GH results in acromegaly where no increase in height occurs because of ossified epiphyseal plate. Corpus luteum is a temporary endocrine gland in human females. It secretes progesterone which stimulates the uterine glands to produce increased amount of watery mucus and is also essential for maintenance of endothelium. In absence of fertilisation, corpus luteum disintegrate leading to menstruation. In angiosperms, the functional megaspore is the first cell of female gametophyte. It enlarges and undergoes few mitotic divisions to form embryo sac. Entomophily is the most common type of zoophily where pollination takes place through the agency of insects. Entomophilous flowers are brightly coloured and secrete nectar to attract visiting insects. Anemophily (wind pollination) and hydrophily (water pollination) do not require attractants or rewards due to the involvement of abiotic pollinating agents. Cleistogamy is self pollination in closed flowers. Single ovule in the ovary and flowers packed into inflorescence are characteristics of wind pollinated flowers. Dioecious plants are those plants in which male flowers and female flowers are borne on different plants. Therefore, they prevent both autogamy and geitonogamy. Double fertilisation is the characteristic feature of angiosperms. Here, two male gametes are released in the embryo sac or female gametophyte. One male gamete fuses with the egg cell to form zygote that gives rise to embryo whereas the other j male gamete fuses with the secondary nucleus to form | primary endosperm nucleus (PEN) that gives rise to endosperm. The sperms in the females genital tract are made capable of fertilising the egg by secretions of the ! female genital tract. These secretions remove coating substances deposited on the surface of the sperms | particularly those on the acrosome. Thus, the receptor ! sites on the acrosome are exposed and sperm becomes I active to penetrate the egg. This phenomenon of sperm i activation in mammals is known as capacitation. Copper releasing IUDs (i.e., CuT) are placed j in the uterus of the females. They are an efficient j birth control methods. Copper ions released by them I suppress motility and fertilising capacity of the sperms. Sickle cell anaemia is caused due to point mutation in which at the 6th position of beta globin chain, glutamic acid is replaced by valine. Thus, it is a qualitative defect in functioning of globin molecules. Thalassemia is caused due to either mutation or deletion which ultimately results in reduced rate of synthesis of one of the globin chains that make up ; haemoglobin. Hence, it is a quantitative defect in functioning of globin molecules. Down’s syndrome is an autosomal aneuploidy, caused by the presence of an extra-chromosome number 21. Both the chromosomes of the pair 21 pass into a single egg due to non-disjunction during oogenesis. Mendelcarriedouthybridisationexperiments on garden pea for 7 years from 1856-1863. 1 codon consists of 3 bases. Therefore, a deletion on 901 position will affect 33 codons. Lagging strand is a replicated strand of DNA which is formed in short segments called Okazaki fragments. Its growth is discontinuous. The direction of growth of the lagging strand is 3’ —> 5’ though in each Okazaki fragment it is 5’ —» 3’. rRNA- (ribosomal RNA) is the most abundant of all types of RNA (70-88%). Hence, it will be present in highest amount. Percentage of fRNA and mRNA is 15% and 2-5% respectively. miRNA (micro RNA) are 21-22 bp long RNA that bring degeneration of mRNA. Spliceosomes helps in removal of introns. They will not occur in prokaryotes because prokaryotes do not have introns and thus, processing does not require splicing of mRNA. Histones help in packaging of DNA. In eukaryotes, DNA packaging is carried out with the help of positively charged basic proteins called histones. Histones are of five types – H1 H2A, H2B, H3 and H4. H, is attached over the linker DNA. Histone contains a large proportion of the positively charged (basic) amino acids, lysine and arginine in their structure. DNA is negatively charged due to the phosphate groups on its backbone. The result of these opposite charges is strong attraction and therefore, high binding affinity between histones and DNA. MALT are significant aggregations of lymphoid tissues which are seen in relation to the mucosa of the major tracts like respiratory, alimentary canal and urinogenital tracts. It constitutes about 50 percent of the lymphoid tissue in human body. Transplantation of tissue/organ often fails due to non-acceptance by the patients body therefore, tissue matching and blood group matching are essential before undertaking any graft/transplant. When the immune system recognises the protein in the transplanted tissue or organ as foreign, it initiates cellular immunity. As a result of this, there is a rejection of transplanted organs. To suppress the immune response during transplantation, histocompatibility antigenandimmunosuppressants play an important role. When breeding is between animals of the same breed for 4-6 generation, it is called inbreeding. Inbreeding, as a rule, increases homozygosity Thus, inbreeding is necessary if we want to obtain a pureline in any animal. Rhodospirillum is a free-living nitrogen fixing bacteria. Mycorrhiza is the symbiotic association between fungi and roots of higher plants. The most common fungal partners of mycorrhiza are Glomus species. Primary or physical treatment is the process of removal of small and large, floating and suspended solids from sewage through two processes of filtration and sedimentation. Methanobacterium is useful in the production of biogas. Penicillium notatum is used to produce penicillin, an antibiotic. Acetobacter aceti is used to obtain acetic acid. The separated DNA fragments can be seen only after staining them with a compound known as ethidium bromide (EtBr) followed by exposure to UV radiation as bright orange coloured bands. Some genes called “selectable markers” help in selecting those host cells which contain the vectors (transformants) and eliminating the non-transformants. molecules, they can be separated by allowing them to move towards the anode. DNA fragments move towards the anode according to their molecule size through the pores of agarose gel. Thus, the smaller fragments move farther away as compared to larger fragments. After the formation of the product in the bioreactor, it undergoes some processes before a finished product is ready for marketing. The process includes separation and purification of products which are collectively called downstream processing. Asymptote in a logistic growth curve is obtained when population density (N) reaches the carrying capacity (K), i.e., N = K.
Presence of pneumatophores, i.e., small negatively geotropic vertical roots and vivipary or seed germination while attached to plant are adaptations of halophytes, i.e., plants growing in saline habitat. Mycorrhiza is a mutualistic interaction between a fungus and roots of higher plants. Ex-situ conservation is conservation of selected rare or threatened animals and plants in places outside their natural homes. It includes offsite collections like botanical gardens, zoological parks, wildlife safari parks, etc., and gene banks. Alexander von Humboldt described species area relationship for the first time. He observed that within a region, species richness increases with increasing explored area, but only upto a limit. Core zone or Natural zone area of a Biosphere reserve is undisturbed and legally protected ecosystem. No human activity is allowed in this zone. Little human activity is allowed in the buffer zone whereas in transition zone, an active cooperation is present between reserve management and local people for activities like settlements, cropping, etc. Restoration region is degraded area which is selected for restoration to near natural form. Aerosols are harmful environmental pollutants which have negative effects on agriculture.